In June, President Trump said a new measure to ease the firing of employees at the Veterans Affairs Department that he was signing into law marked a “transformative change.” One year into his presidency, however, and six months after the enactment of the law, the administration that made firing more employees at VA a cornerstone of its veterans policy agenda has yet to fully realize Trump’s promise. 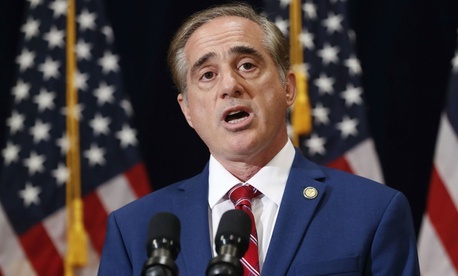 On Wednesday, the Senate Veterans' Affairs Committee is holding a hearing to solicit from VA Secretary David Shulkin a progress report on implementing the 2017 VA Accountability and Whistleblower Protection Act. As one of the marquee veterans laws from last year and perhaps the most significant legislative achievement Trump signed in his first year in office before completing tax reform, the firings and other disciplinary actions taken since Congress passed the act will likely play a major role in the hearing. 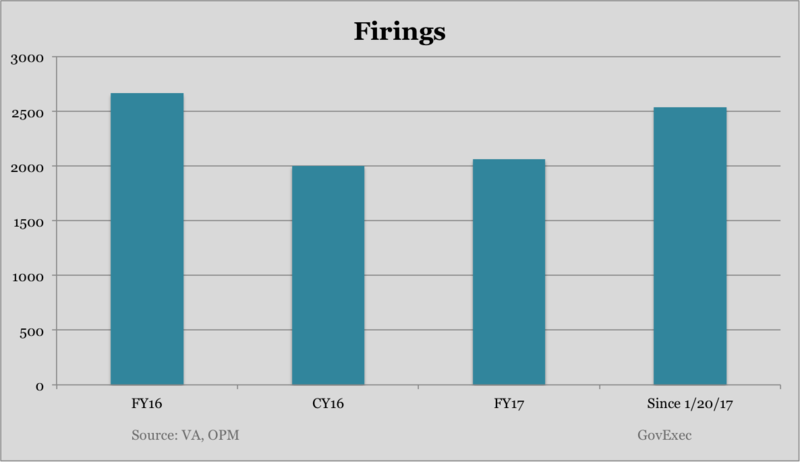 Shulkin will likely tout the progress VA has made on the disciplinary front, but the numbers show little, if any, significant change. VA has fired 2,537 employees since Trump took office in January. Public data on the department’s new accountability website show 1,455 removals, but VA said the figure reaches the higher total when coupled with probationary terminations. According to data maintained by the Office of Personnel Management, VA fired 2,662 employees for discipline or performance in fiscal 2016, the last fiscal year entirely under President Obama. Despite the new law and the Trump administration’s focus on holding badly behaving and poorly performing VA employees accountable, firings actually declined by nearly 5 percent. Curt Cashour, a VA spokesman, said that according to internal department data, it fired just 2,001 employees in calendar year 2016. That would mean VA firings actually increased from 2016 to 2017. OPM’s data shows just 2,061 firings in fiscal 2017, just over one-quarter of which included the post-accountability law era. Still, the period was primarily controlled by the Trump administration and firings at VA declined by nearly 23 percent from fiscal 2016. Cashour emphasized that fiscal year and calendar year comparisons were not apples to apples. Cashour also noted firings and other disciplinary actions have increased since the law’s enactment. VA fired 983 employees in the five months between Trump’s inauguration and the enactment of the accountability law and 1,554 employees in the six and a half months since then, an increase in the daily firing rate. Cashour said VA has depended on the new law's authorities for "most VA disciplinary actions." The rate of total disciplinary actions per day has remained roughly the same since June 23, the day Trump signed the measure into law. The law, Cashour, said, "is one of the most significant federal civil service reforms in decades and is helping instill across the department the type of workforce accountability veterans and taxpayers deserve." House Veterans' Affairs Committee Chairman Rep. Phil Roe, R-Tenn., said most VA employees are hardworking and have the best interest of veterans at heart, but the old disciplinary process prevented "effective and efficient" action. The bill allows the department’s secretary to fire, suspend or demote an employee with only 15 days' notice. Employees can appeal to the Merit Systems Protection Board in an expedited timeframe. MSPB then has 180 days to issue a decision, with the law designed to make it easier for VA to prove a negative personnel action was warranted. Employees would maintain the right to appeal an MSPB decision to federal court. Unionized and Senior Executive Service employees have distinct, internal grievance processes that have to be completed within 21 days. Two House committee aides said they were paying attention to the numbers from VA, but did not necessarily view it as a key metric. The goal of the law was to make it easier to hold employees accountable when warranted, not to fire more total people, they said. They added they have been in touch with VA management and front-line supervisors and heard anecdotally that employees are more incentivized not to engage in problematic behavior in the first place or simply resign when facing discipline. While firings have ticked up since the law was implemented, the lack of a massive swing in terminations perhaps demonstrates that some of the concerns with the bill raised by various stakeholders during the legislative process were unfounded. Employee groups, for example, warned the measure will lead to politicized punitive actions and labeled it an existential threat to the non-partisan civil service. “The sky is not falling,” one committee aide said. Congress passed the law after multiple investigations revealed a widespread VA practice of manipulating patient data to give the illusion of shorter wait times for appointments. Obama initially signed a law in 2014 aimed at expediting the firings of just the department’s senior executives, but the constitutionality of those provisions was questioned in court and VA eventually stopped using them. VA’s data show the department is not necessarily targeting individuals directly involved in veterans’ medical care, which lawmakers said were the target of the new firing authority. VA fired just 10 employees in medical records positions in 2017, 48 physicians or physician assistants and 308 nurses or nursing assistants. By comparison, it fired 177 employees in housekeeping and 82 in food services. 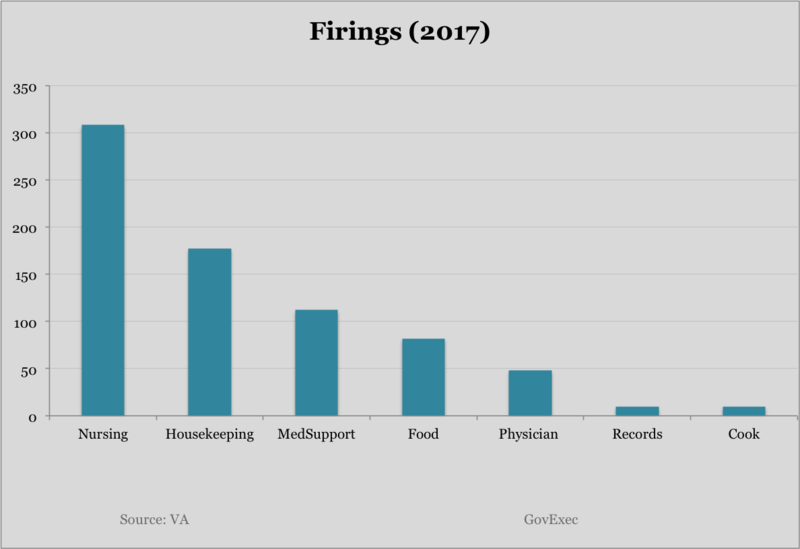 To put that in perspective, VA fired one doctor for every 1,000 it employs, while it removed three nurses for every 1,000; four medical record technicians for every 1,000; and 10 food service workers for every 1,000. VA employed just 227 employees in housekeeping management as of September. The department fired one SES employee in fiscal 2016, compared to five (of the 138 it now employs) in fiscal 2017. Cashour said VA was committed to holding accountable any employee deemed to have not met standards. "Culture spans the entire organization," the spokesman said. "As with any government agency or business, VA has more rank-and-file workers than senior leaders, and we hold them accountable when warranted, regardless of rank or position."